Hands-On Real LIVE Practice-Labs allow you to experience practical application of course concepts in authentic environments without purchasing expensive equipment or software. Test drive your new skills as you learn! The 642-902 Practice-Lab will provide you with the necessary platform to gain hands on skills on implementing IP routing. By completing the lab tasks you will improve your practical skills in using advanced IP addressing and routing in implementing scalable and secure Cisco ISR routers connected to LANs and WANs. These same tasks will help you understand the objectives and competencies required by the Implementing Cisco IP Routing exam. Pro-active and comprehensive support services will assist you in resolving any technical issues you encounter connecting to your Real LIVE Practice-Labs. Configure the EIGRP, OSPF and BGP routing protocols: Understand the fundamental configuration tasks of these common routing protocols found in almost every organisation. Learn some advanced configuration techniques and how to solve some problems that you may encounter in the real world. 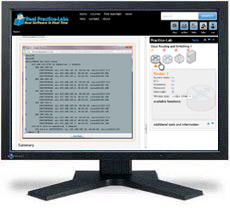 Configure advanced route redistribution and route filtering: Configure advanced route filtering and redistribution techniques including route-maps, distribution and prefix lists to understand the different methods to modify routing information as it passes throughout the network. Configure IPv6 and advanced technologies: Get prepared for IPv6 using our advanced IPv6 configuration labs, helping you to understand how to build IPv6 networks to coexist in an IPv4 based environment. Configure IP SLA and PBR services: Learn how to configure advanced features to tune packet flows throughout a Cisco network.